This article is about the part of the World Wide Web not indexed by search engines. For the part of the World Wide Web which exists only in private networks, see Dark Web. 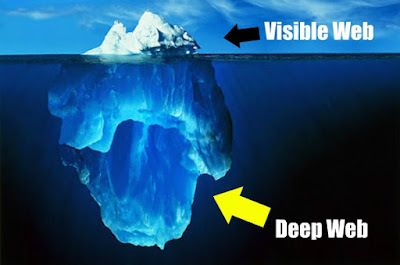 The Deep Web, also called the Deep Net, Invisible Web, or Hidden Web, is the portion of content on the World Wide Web that is not indexed by standard search engines . The contents of The Deep Web by yourself is very dangerous and it is not to publish publicly. There there are the business of prostitution, the sale of human beings, the assassin, the secret archives of the country, the mafia, drug sales, and places too great hackers. Therefore if you want to get into The Deep Web you must wear special software because there is also the goal of computer viruses. You can use Tor Browser, here is a quote about the Tor Browser. One of the most secure way to access the deep web is using TOR Browser. TOR is the length of The Onion Router. TOR is basically a web browser, has a way of working that is the same as other browsers such as Google Chrome, Yahoo, Bing, and others. However, TOR has a greater ability of them mainly for accessing information that cannot be found through Google and other search engines. TOR can be called software such as a VPN that allows us to access the internet anonymously. Because in the deep web lots of hackers who can threaten the security of the Internet, then TOR can protect you from it. When you run a TOR user's original connection to be transferred to the network belonging to the TOR. The network is encrypted so that it cannot be detected by any party from either the ISP or site that you visit.